Parking placard abuse might be most noticeable in hotspots like Lower Manhattan and Downtown Brooklyn, but it’s an epidemic in neighborhoods across the city. 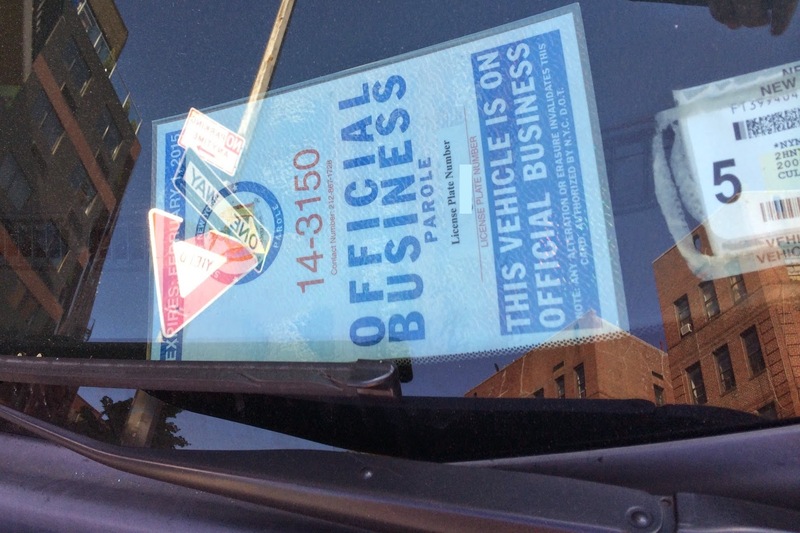 Reader Eli Forsythe sent in photos of an illegally-parked car with a placard on the dash in Prospect Lefferts Gardens last weekend. The car was parked in a no-parking zone in front of a fire hydrant on the north side of Captain Oakley Jr. Square, where Caton and Bedford Avenues meet. The driver was parked using a parole officer placard on “official business” for at least 24 hours on Sunday and Monday. Even real placards (as opposed to the bogus variety) don’t give drivers carte blanche to park in bus stops, on sidewalks, in front of hydrants, or in no-parking zones. Spot placard abuse in your neighborhood? Snap a photo, including the curb and the nearest parking regulation sign if possible, and send it to tips@streetsblog.org. Streetsblog will not publish on Monday in observance of Memorial Day. We’ll be back on our regular schedule Tuesday. People who do this are scum – lazy, selfish lowlifes. I wear out the 311 phone app reporting parkers obstructing fire hydrants. Makes me want to smash the window and steal the placard. When the driver gets tired of replacing windows, or their boss gets tired of replacing placards, the behavior will correct itself. Reigning in scofflaw parking is really necessary to create a culture of respect and safety on our streets. Loved your article on NYPD corruption. Yes, a culture of systematic dishonesty corrupts and perverts the NYPD. It has to stop. There are many other police forces that do not tolerate their members routinely breaking the law. NYPD can be one of them. This is bad. But probably not as bad as the dirtbag cops who work hard to protect their ability to drive recklessly. They put license plate hiders on their cars, tip each other off about locations of camera enforcement, and try to block legislation that would keep us all safe. Check out what they’ve been up to! God, that looks like it was designed by a 13-year-old in 1997. WOW. And I thought the comments sections on Fox News was crazy….